Our Kauai tobacco is wrapped in a Connecticut shade leaf grown in Ecuador. This silky cream like cigar has a medium to full bodied taste. Our Kauai tobacco is wrapped in a dark Habano leaf grown in Nicaragua. It is a full bodied smoke and is filled with deep complex flavors. 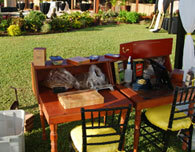 Kohala is named after Jon Adams who owns Mother’s Antiques and Fine Cigars on the Big Island of Hawaii. Jon is a life long cigar aficionado, and has lived in Hawi, North Kohala for many years with his wife Dixi. They are active community members, and Jon is often referred to by locals as, “The Unofficial Mayor of Kohala”. Bumboocha is a slang term used in Hawaii for the big one. This name was inspired by cigar aficionado, Joe Hilton., Joe owns Honolulu’s number one cigar shop, Cigar Cigar.